The National Park Service (NPS) has 12 units in Colorado including four national parks (Black Canyon of the Gunnison, Great Sand Dunes, Mesa Verde, Rocky Mountain). There are also four national monuments administered by the Bureau of Land Management (BLM) and US Forest Service (USFS). Like most national recreation areas, Arapaho is centered on an artificial lake, or rather lakes - five of them in all, near the far upper end of the Colorado River, adjacent to the west edge of Rocky Mountain National Park. 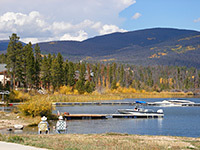 Lake Granby and Shadow Mountain Lake are the two largest, and both have good access and many facilities, with various shops, campsites, marinas and picnic sites along their western edges. The east slopes are less accessible, since 12,000 foot mountains rise up steeply from the shoreline. Alongside the Arkansas River in southeast Colorado, Bents Old Fort was an important trading post on the Santa Fe Trail, and was active for 16 years before being destroyed in 1849. The fort was reconstructed in 1976, forming the centerpiece of a historical park that also has a museum and various interpretive programs. 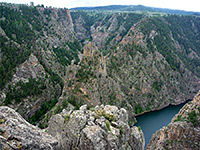 Formed by the Gunnison River as it flows through ancient, erosion-resistant rocks at the western edge of the Rocky Mountains, Black Canyon is a particularly dark, narrow and sheer-walled gorge up to 2,000 feet deep in some places. About 13 miles of the canyon are protected in a national park, which has a scenic drive, various overlooks and a few trails, including one rather difficult route to the river - all on the south rim. The north rim is also accessible, by a unpaved road. A wooded area north of Salida in the eastern Rocky Mountains became a national monument in February 2015, centered on a scenic canyon formed by the Arkansas River, a popular whitewater rafting location. The surrounding land, also part of the San Isabel National Forest, is crossed by various trails which climb higher into the mountains, generally between 7,500 and 9,000 feet elevation. 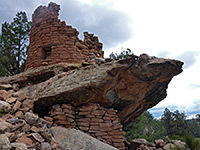 There are many wooded, steep sided canyons containing numerous ancient Anasazi ruins in the plateau land near Mesa Verde National Park, and a large area of them have been incorporated into a relatively new national monument (established 2000), which occupies generally inaccessible BLM land in the southwest corner of Colorado, west of US 491 and adjoining the border with Utah. 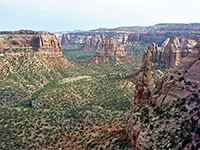 The area extends from Squaw Canyon in the north, across various tributaries of Hovenweep Canyon and Yellow Jacket Canyon to the northern branches of McElmo Creek. Chimney Rock is a narrow butte overlooking the Piedra River in southwest Colorado, between Durango and Pagosa Springs, and is the site of an ancient pueblo, inhabited around 1,000 years ago. The relics include several structures aligned with astronomical features. The butte and 4,726 acres of the surrounding, mostly wooded land became part of a national monument in 2012. Colorado National Monument is named after the river rather than the state, and covers a relatively small area of eroded red/orange rock formations and canyons just south of the Colorado near Grand Junction - there are four main ravines plus many smaller canyons, cutting into the Uncompahgre Plateau for several miles and viewable from a 20 mile scenic drive along the plateau edge. The monument is not one of the top attractions of the Southwest, but well worth visiting for at least a few hours. Curecanti NRA contains a long section of the Gunnison River as it flows through mountainous terrain in the western Rockies, and is centered on three artifcial lakes: Blue Mesa Reservoir (the largest), Morrow Point Reservoir and Crystal Reservoir. 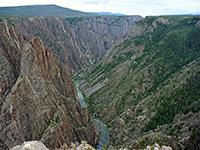 The NRA lies immediately upstream of Black Canyon of the Gunnison National Park. Although most activities take place on the water, there are several trails across the surrounding hillsides. 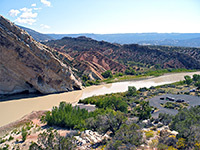 An extensive wilderness of sandstone canyons and mountains around the confluence of the Green and Yampa Rivers is protected as the Dinosaur National Monument, either side of the Utah/Colorado border, though the area is most famous for the many large dinosaur fossils that were excavated from just one location, close to the Green River near Vernal in Utah. The discovery site is now enclosed by a building (currently closed for reconstruction) allowing close-up inspection of various unexcavated bones; besides this the monument has two paved scenic drives and a selection of trails. The main purpose of Florissant Fossil Beds National Monument is to preserve a group of petrified sequoia stumps, scattered over a pretty, pastel-colored landscape of yellow-green grassy plains bordered by low wooded hills, 35 miles west of Colorado Springs in the foothills of the central Rocky Mountains. 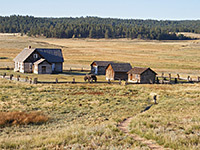 The monument also contains many smaller fossils and a well preserved 19th century homestead, plus 14 miles of trails. 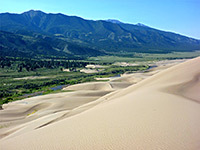 One of the most unusual landscapes in Colorado is found towards the upper end of San Luis Valley, at the foot of the Sangre de Cristo Mountains - an area of golden-brown sand dunes 7 by 5 miles in extent, rising up to 700 feet above the flat surroundings, and completely lacking any covering vegetation. The most popular hiking destination is the top of the tallest dune, which is less a mile from the entrance road. The park also includes a section of the mountains and part of the valley floor, further protected as a national wildlife refuge. 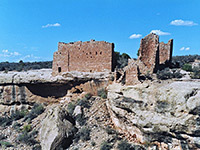 In an isolated and little-visited part of the Southwest either side of the Utah-Colorado border, Hovenweep National Monument preserves the remains of six villages from the Pueblo period of the mid thirteenth century. Although in some cases little remains beyond a pile of stones or low wall remnants, the interest and appeal is enhanced by the general remoteness and peaceful nature of the surroundings. Reflecting the importance of the historical antiquities in this part of Colorado, Mesa Verde is the only US national park that protects man-made structures, as opposed to natural features. In hilly, wooded country south of Cortez, there are over 4,000 separate ancient ruins, many of them large structures built under steep, overhanging cliffs in narrow canyons. 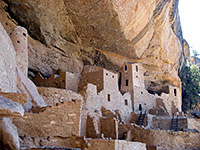 Mesa Verde is the most famous and highly visited archaeological site in the US, due to the number, the size and the excellent state of preservation of the buildings, together with their scenic location. The Rocky Mountains span the whole length of Colorado and all the scenery is spectacular, but the region selected (in 1915) to form Rocky Mountain National Park is towards the north of the state, 60 miles from Denver - an area 25 by 20 miles in extent, which includes the northernmost fourteener in the state (Longs Peak), and is crossed by just one road, US 34 between Granby and Estes Park. 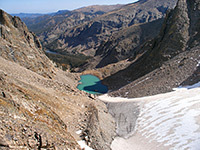 The park has numerous lakes, streams, waterfalls, forests, meadows, summits and glaciers, all viewable close up from a good network of trails. The Sand Creek Massacre took place on 29th November 1864, when 133 people from the Arapaho and Cheyenne tribes were killed by a group of local militia, near the modern-day towns of Eads and Chivington in the grasslands of southeast Colorado. The precise location was only rediscovered following archaeological investigations in 1999, and the area became a national historical site in 2007. As yet there are few facilities, and not much to see. On the east side of Sleeping Ute Mountain 8 miles south of Cortez, Yucca House National Monument contains the unexcavated remains of an ancient pueblo, dating from 1200 to 1300 AD and quite large in extent. Although open to the public, the monument has no facilities, and travel here is not recommended.